Jack Ma, arguably the richest man in Asia, was in the Philippines for some engagements. 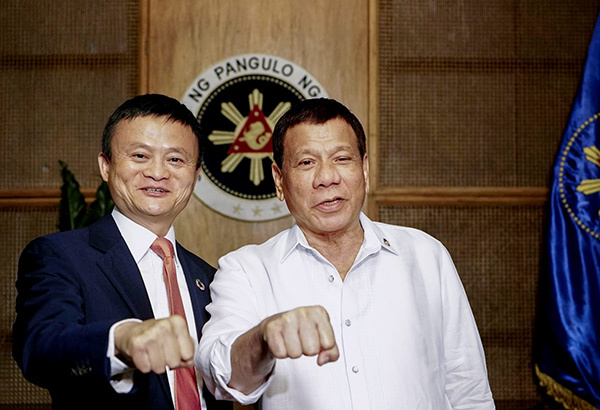 Alibaba founder and executive chairman Jack Ma looked upbeat after a meeting with President Duterte at Malacañang yesterday despite reports that he complained of the slow internet connection in the country. Duterte and Ma talked about bringing in platforms to boost the mobile technology, internet banking and e-commerce industry in the Philippines. Yesterday, at the forum organized by the De La Salle University, Jack Ma eagerly complained about the current state of the internet in the Philippines. The Philippines' slow internet had even the ever-optimistic Jack Ma, founder and executive chairman of global tech giant Alibaba Group, frustrated. "I arrived late last night and I tried to test the speed of Philippine internet... It's no good," the Chinese tycoon said in a forum at De La Salle University on Wednesday, October 25, after having been awarded an honorary degree in Technopreneurship. Last May, Akamai Technologies' Global State of the Internet Report showed that the Philippines has the slowest average internet speed in Asia Pacific. But that deal fell through and the saga of the search for a 3rd major player to provide more competition to the two established firms took another turn earlier this week when the Court of Appeals affirmed Globe and PLDT's P69.1-billion deal to split SMC's telco assets. Startled by the impact of Jack Ma's comments, PLDT and Globe went scrambling to defend their respective firms.